Sakai Guides and DocumentationFaculty Guide Set Up a Discussion ForumHow do I organize forums and topics? Forums may be rearranged to change the order in which discussions are listed. 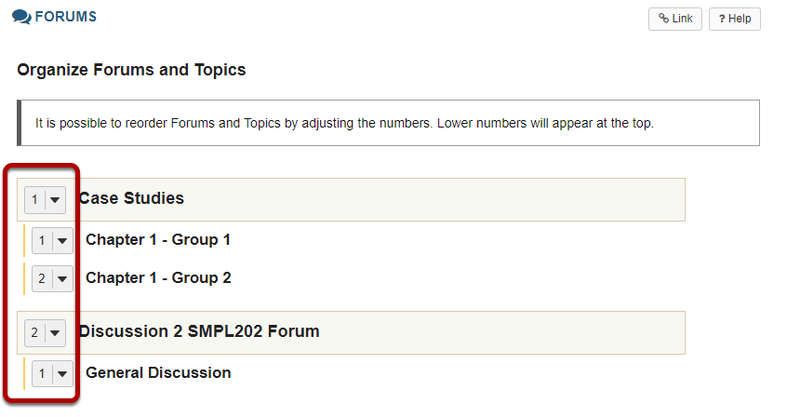 The numeric pull down menu allows for reordering the Forum, Topic or both. Select the appropriate number for the order in which the items should appear. After you have placed the forums and topics in the desired order, click Save. Prev: How do I add a new topic? Next: How do I post to a forum topic?